We want to share a fun project with you that you can begin for the next Moon cycle! It is what we call a “Moon Board” similar to a vision board or mood board, but with a Lunar twist of course! We will show you how to create it and work with it throughout the Moon phases to really amplify, tune in, and manifest your intentions and goals. Get your scissors and glue ready and let’s begin! glitter/stickers, anything you want to make it pretty and unique! Each section represents the 4 main turnings of the Moon cycle: the New Moon week, the First Quarter/Waxing Moon week; the Full Moon Week; and the Last Quarter/Waning week. Feel Free to write down each date for the four turnings in each section and what sign they are in. Or you can keep it blank so you can keep reusing this! That is also why I also suggest a cork/bulletin board. Either is great! You can always find the dates for the moon cycle on our New Moon energy reports, or the Tune to the Moon planner! But if you have a moon app that works too! Secondly, put your Moon Compass in the center of the board. We always align our New Moon with the east quadrant and our Moon Compass is the same. So the moon phases on the compass should align with your Moon phase sections on the board. A Moon Compass helps you track your energy or intentions daily with the moon phases. The more you track your energy the more you can see patterns emerge so you can understand your unique flow of energy better. We have a free Moon Compass you can download here or you can use your Tune to the Moon Planner. Marissa also has a Lunar e-book that teaches you all about Moon charting! Please note: The Moon Compass will be opposite for the Southern Hemisphere, so create your quadrants according to your Moon Compass so they all align. Now that you have your Moon Board prepped and ready for the next Moon cycle, read below how to use The Moon Board during each Moon phase! Now that you have placed your Moon Compass… on the actual date of the New Moon for the Moon cycle up ahead you can use this board and write your intentions and begin to track your energy daily by coloring the moon slices! What do you want to set into motion? What do you want to release? What lights you up right now? What is your New Moon intention/goal/desire? What is your vision for this Moon Cycle? Begin to scour your magazines and find images and words that align with your vision. Have fun! Put on some music and ignite your creativity! 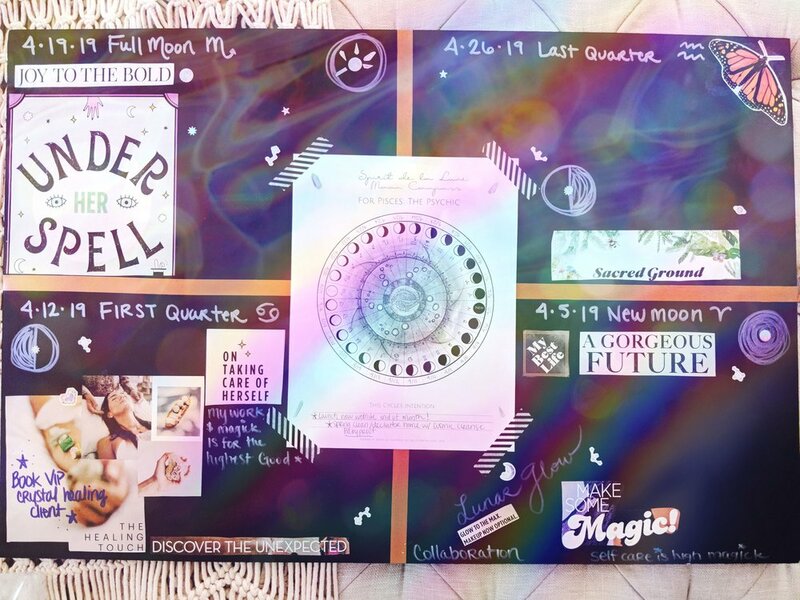 In the New Moon Quadrant write your intentions and glue your images and words into this section creating your first mini vision board! Pull a tarot/oracle card for each quadrant… what is the current energy showing you? What does it reveal about your next step? When the Moon is Waxing.. The First Quarter Moon phase is all about action, momentum, and ignition… but not just any kind of action. Inspired action is key! Everyday during this week, do this mini inspired activation meditation using your Moon board and a candle. It doesn’t have to be long, just long enough for you to get tuned in and spark your inspiration. What is my Soul calling me to do today? How can I be of service today? What is the message I need to share today? What am I inspired to do today? Notice, the questions are focusing on TODAY. Stay in the present moment during this phase. You have already focused on the bigger picture during the New Moon week, now it is time to trust your intuition and begin where you are at. The time is NOW. Sit with these questions and gaze into the flame. Write any messages you receive and when you feel ready, read your journal entry and choose something you feel called to do. Write one inspired action on your Moon board and put your focus and energy into this one next step. As you keep flowing with this exercise you may want to add more than one step a day, but just start with one inspired action for now, so you don’t get overwhelmed. If you do this everyday during the First Quarter week, you should have about 6-8 inspired actions steps you actually took this week! That is amazing! You are amazing! Is there a crystal that can help you stay motivated and inspired this week? Does each inspired action have a crystal to work with? Feel free to pin/tape you other to-do lists in this section, this is a time to get sh** done! The Full Moon illuminates everything in your life. She illuminates the good, the bad, and everything in between. Now is the time to cultivate gratitude in your life and focus on the blessings. Open your heart to compassion, forgiveness, grace, and love. What blessings have I received this day? What is opening my heart? What is my intuition guiding me to do? What am I loving about myself right now? Answer those questions and write a couple of the most meaningful ones in the Full Moon quadrant. When it is the Full Moon, take your glass of water and charge it with all the things you wrote on your Moon Board. Hold your glass heart level and repeat aloud what you wrote. Let the water charge under the Full Moon and drink this beautiful Moon-charged elixir the next morning! Place a rose quartz of clear quartz in your water to amplify the energy! Color in the Full Moon Moondala in the Tune to the Moon planner! The Moon cycle is winding down and all the energy you have built up and created during the Moon cycle is now coming back down to earth. This means you could begin seeing your goals and intentions coming to fruition and completion, or it is time to release them and let them go and learn from them. What did you complete this Moon cycle? Did you complete your intention? Did this Moon cycle progressed as you envisioned it would? Did your intention change or shift? Write at least one thing you are letting go of each day on your Moon board is the Last Quarter quadrant. Take your dark stone and ask it to help you release whatever you wrote down. Lay it out under the moonlight on the earth each night this week. IT is import to place it on the earth because Mother Earth will be absorbing this energy and transmuting it for you. Place the stone on the Moon Board during the day. Prep your next Moon Board! Keep moon charting daily! PLEASE NOTE: The Moon compass may miss the last 2-3 days of the Moon cycle… this is the Dark Moon phase and a time to rest and just be. We hope you enjoyed this DIY and we hope you make your own! Please share pictures with us! Spirit de la Lune update! Decks are currently sold out! Please sign up for our newsletter to keep in the loop when the next batch is ready! But you can still purchase Tune to the Moon Planners! They are on sale! Book a reading with us! This Full Moon takes place on the 19th of February and is also a Supermoon! This is the second Supermoon in a series of three, (we will have another supermoon in March!) but this Supermoon is also the biggest Supermoon of the year! Pretty cool compared to February of 2018 having no full moon at all! A Supermoon is when the moon orbits closest to the Earth, making the moon appear larger in the sky, thus amplifying the lunar energies and our emotions. Color in your own mandala each full moon! Click on the link to purchase the planner! The moon is symbolic of our inner world, our intuition and our emotions, and this one is the Planting Moon according to the Spirit de la Lune deck. It’s important to take note of what you are “planting” right now! This Supermoon in Virgo represents a very potent time for manifestation and achieving our goals… Especially with it taking place in 0º which holds total raw potential for new beginnings. This Full Moon is adventurous and exciting holding lots of opportunities for change. Be on the lookout for good news and a sense of things coming together. Our last New Moon post talked about answers coming and things finally falling into place… to help make that happen, we’ve put together a special ritual for this Full Moon! We will be combining several earth elements into an intention oil and then using it to anoint an intention infused candle! You can do this ritual on the days preparing for the full moon, or on the full moon! Preparing the oil a day ahead can be helpful, but it’s not needed! Using a paper funnel pour your carrier oil into your prepared jar. Once the jar is about 3/4 full, add the herbs and essential oils of your choice. Be mindful as you add each ingredient. It’s important to remember your intent while you are making the oil! When you have added all of the herbs and oils, add a crystal or two to the oil as a final intent and offering. Give your bottle a good shake and cleanse and charge it under the moonlight surrounded by a crystal grid. This oil can now be used for anything you want! Lunar energy can be felt 3 days prior, and 3 days after the Lunar event, so you can make and charge this any time around the Full Moon and still be able to use it! Depending on the carrier oil you used you can use it as a perfume or hand/lip moisturizer. You can use it to anoint crystals or other special objects. We created it for anointing candles for this Full Moon. A powerful but simple way to solidify and add power to your intention is to create an intention candle! Choose your candle color based on your intention or goal and come up with a simple word, affirmation, symbol or sigil that will help solidify your intent. For this Full Moon Ritual, I carved the word “Home” into my candle to help me find the home that I’ve been looking for. I’m hoping that burning it on my altar with the vision board from last November will help give me that last push I need! Using an altar knife or athame, carve into your word, symbol or phrase into your candle. Once the candle is carved and ready, anoint it with your intention oil. There are several ways that you can anoint your candle and many schools of thought on it. Some say that rubbing the oil from the top to the bottom of the candle will help bring in prosperity and growth, while rubbing the oil from the bottom up will help banish or get rid of something in your life. There are no set rules on this, so as long as you rub the oil into the candle with intention, you are anointing it. Burn the candle during the Full Moon on your altar. Remember to only burn under supervision and during ritual. This will keep your altar safe and your awareness focused on your intent. You can use this candle to burn written intentions on paper later if you don’t want to burn it all in one night. Leave your oil bottle and your candle out with your decks and crystals to charge under the Full Supermoon! Don’t forget you can reuse this oil for many things! It’s infused with potent Virgo energy and lots of intention so be sure to use it up. Head over to our instagram to enter the giveaway for the planner! The winner will be announced on the night of the Full Moon over on instagram! Happy Full Supermoon & Lunar Eclipse! What a beautiful & powerful way to kick off the New Year! A Super Moon is what happens when the moon is closer to the earth than normal making her appear larger in the sky. This event can intensify our emotions, enhance our intuition, and can even bring about unexpected news or events. This Supermoon is also a Lunar Eclipse! This will intensify our emotions even more while bringing us new revelations and insight. Lunar Eclipses also have the ability to bring us life altering news, so expect the unexpected with this one! A Lunar Eclipse is when the Sun is opposite the Moon, this lets us take a look into our emotions and close relationships in a different way, with fresh eyes and new perspective. You might feel overly aware of the imbalances in your life on top of your enhanced sensitivity.The Moon is also square Uranus, which can cause moodiness, impatience and impulsive reactions. Allow the Lunar Eclipse to help you stay objective so you can keep your mind set towards growth and progress. This is also the Sage Moon according to the Spirit de la Lune Deck and Planner. Each Full Moons has varying names according to different cultures throughout history. This month, according to our system marks this as the Sage Moon. A time of cleansing and making way for the potential growth that lies ahead. Remember that major shifts are taking place... this can open you up for so much growth ahead. Trust this Divine Cosmic Energy and allow it to transform you. Get proper rest and don’t forget to stay hydrated! For tonight’s ritual, we are creating intention incense! Because this Full Moon takes place in both Leo and Cancer depending on locations and time zones, we are also including a meditation for both! Honor the Sage Moon Lunar Eclipse by creating your own intention incense to invoke the energies you want in your life. Cauldron or a fireproof container for burning. Bay leaves are known as ‘Witch’s Note Paper’ and have long been used in spell work! In ancient times, bay leaves were even eaten by the Oracles of Delphi before giving divination. Bay leaves are used to enhance psychic powers strengthen intentions and give protection to the user. Using your mortar & pestle, grind up your bay leaves. Keep your intentions and goals in mind as you grind your herbs and create your incense. If you need to grind your other herbs, empty the bay leaves out first. Yes you’ll be mixing the herbs together, but it will grind easier with less in the bowl. Mix the bay leaves with the other herbs of your choice and store in an airtight jar. During the Eclipse, burn them on your altar in a cauldron or other fire-safe container. Watch the smoke to drift towards the heavens carrying your intentions and wishes. Cleanse your energy in the smoke. Clear and purify your decks and crystals with it. Allow it to burn on your altar to charge your intention and focus the energies you are wanting to bring into your life. While the incense burns and does it’s work, try one of these visualizations under the Full Moon Lunar Eclipse! In the Celtic tradition, the Three Cauldrons are sacred containers within your body that hold the energies of magick, spiritual wisdom and creation. The Three Cauldrons can be loosely related to the Third-Eye, Heart, and Sacral Chakras, but they are not the exact same energies. They are also linked with the Earth, Sea, and Sky. Close your eyes and visualize a beautiful cauldron within your Third-eye. What does this cauldron look like? Imagine the Lunar Eclipse energy pouring into this cauldron... What kind of magick begins to brew? Let this cauldron bubble over and flow into the next cauldron within your heart space. What does this cauldron look like? What emotions surface for you? Let the energy keep brewing and flowing through you. When your cauldron begins to bubble over again, let the energy pour into the third cauldron within your pelvic bowl. What does this cauldron look like? And what does your magickal brew look like now? Connect and feel all three cauldrons working together. They are alchemizing your intentions and holding space for your magick to flow. Stay in this space for as long as you like! Invoke the energy of the Empress (2019 is the year of the Empress according to Tarot), and the noble, royal energy of the Leo by closing your eyes and focusing on your Crown Chakra. Imagine the the beautiful Full Moon shining above you and pouring her Moonlight into your Crown. As your Crown Chakra fills with Moonlight, you begin to feel the weight of a crown on your head and a beautiful crown forms across your brow. What does your Crown look like? This Crown connects you to the Divine, your guides, and helps you act from your Higher Self. How does it feel to wear this crown? What messages do you receive from the Divine? After you are done with your visualizations and ceremony, you can bury the ashes of the incense or put them in a flowing stream of water. If you’d like to save them, you can use the ash for black salt. Happy Super Full Moon and Eclipse! Don’t forget to charge your decks and crystals under this powerful moon! ..before we go… we have exciting news!! The planners are now shipping! We are so excited to announce that the planners are now in our hands and are no longer in ‘preorders’! This planner has been a culmination of hard work, a lot of love, obstacles, and frustration... The whole spectrum of emotions have been felt! Thank you all so much for your love, support, and patience, as we learn to navigate new-to-us production, shipping and manufacturing. It is not easy being a two-woman show across multiple states, but somehow Rachael and I make it work! If anything, we have learned so much from this creation. To be completely honest, we are still a little hesitant to make the 2020 planner, there were so many delays we could not have foreseen, but moving forward we will definitely do everything we can to ensure everything goes smoothly and timely. If we make the 2020 planner, we will start creating it way sooner! Marissa will not be pregnant the majority of the year so that will help. We will not rely on others to make deadlines they cannot keep. And finding a local printer is priority... Shipping is cray! All that being said, it is amazing to see your own creations come to life and manifest physically! You can create anything you put your mind to! Dedication, focus, support, and passion build the foundation for manifesting. Happy Full Moon & Merry Solstice Season! The Wolf Full Moon this year takes place the day after the Solstice, Yule... the darkest day of the year in the Northern Hemisphere, or the lightest day (Litha) in the Southern Hemisphere. We thought it would be fun to share 7 ways to celebrate the Winter Solstice, and in turn, you can do any of these activities on the Full Moon as well! Listen to your intuition and choose 1 or more activities below to celebrate Yule and the Full Wolf Moon! Yule is one of the seasonal celebration of the Sun and light on the Wheel of the Year. It marks the rebirth of the Sun after the darkest day of the year. It symbolizes hope and renewal knowing the darkness will pass and light will always return. An omen much needed in the cold winter months. A beautiful and ancient tradition is burning the Yule Log. Evergreens, have always been venerated by the ancients because of their eternal nature and ability to live through the cold Winters unlike the deciduous trees. The Druids would travel deep into the forests in winter to harvest Holly and Mistletoe, and the Yule log was either gifted or chosen on one’s own land and burned specifically on Yule in the hearth of the home. We can replicate this tradition by burning a specific log in the fireplace, or creating a Yule log and drilling 3 whole in it to place candles in. Write your intentions on the log, sprinkle it with herbs, pour mead or wine on it as an offering to the Fae or the God and Goddess, or Holly King, and burn it the night of Solstice. You can also dress the candles if you cannot burn a full log. Or you can celebrate with a bonfire. A Yule tree carries great symbolism and in a way is an altar in of itself, what we hang and put on our tree is very important to our personal beliefs. 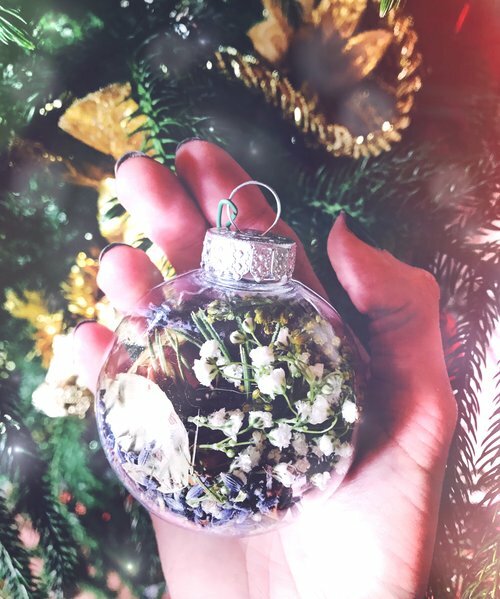 So amp up your yule time altar by placing a beautiful and herbal-charged ornament onto your yule tree! With Winter in full swing in the Northern Hemisphere, the Cancer Full Moon may be pulling you to stay home and seek nourishment (or gravitate towards the ocean in the Southern Hemisphere heat of Summer). The Wolf Moon encourages you to listen to your body. Listen to your primal instincts and what you need right now. To honor both the dark and light of Solstice hold a vigil for yourself and focus on your intentions and meanings of Yuletide. Turn off all lights and experiencing the longest night of the year, reflect on renewal and peace, what 2018 brought you and what Yule means to you. When you are ready, or when it is the exact time of the Winter Solstice, turn the lights back on to symbolize the birth of the New Solar Year, or watch the sunrise. The Wolf Moon is a time to celebrate with your tribe, so we thought we would show you how to create your own moon circle and celebrate with all your sistars to bring in the Solstice with lots of love, connection, and joy! What has the darkness taught me? What is the light revealing to me? How can I shine my light even brighter than before? A word of the year allows you to choose something that is a guide or inspiration, a reminder rather than a rigid goal. A Word of the Year acts as an anchor that can bring you back to your center and core goals. Learn how to choose a word of the year for 2019 with our ceremony! We hope you have a beautiful Holiday season, whatever you may celebrate, and may 2019 be your most magickal year yet! Make 2019 your most Magickal Year yet! Pre-order the 2019 Tune to the Moon Planner! We are just as excited to get our hands on it as you are! If you have purchased it already, your confirmation email is the PayPal confirmation you received. We should begin shipping the planner the second week of January, or as soon as we receive the shipment from our printer! We apologize for the delay, but it will be worth it! We promise! 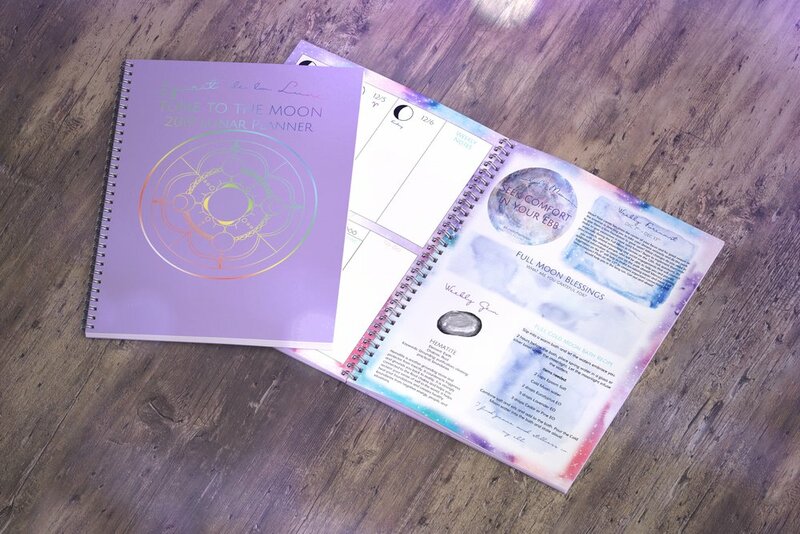 Whoever pre-orders the planner, will also have the option of joining Marissa in the Tune to the Moon private FB community for her new e-course, The Cosmic Cleanse, launching on the New Moon 1/5/19! This Full Moon takes place in the earthy sign of Taurus, a sign of strength and endurance. In many ways, you may feel your own patience and inner strength being tested. Remember to stay grounded and remain rational during this time. Venus is still retrograde in Scorpio and is opposite this Full Moon in Taurus. Taurus holds energy of new growth and life- while Scorpio holds energy of darkness and death. Venus, the planet of love, represents our relationships, with others and ourselves. The Moon represents our emotions and intuition. This means there may be some changes and shifts going on in our relationships, and Scorpio means the transformation may feel chaotic. It’s important to practice patience and forgiveness with others right now. Taurus is also known as the Lover, so remember to not only stay grounded, but in your heart space. For tonight’s Full Moon we are keeping this blog post pretty simple. We are currently celebrating new life with the arrival of Autumn, Marissa’s new baby, and simultaneously stepping into the season of death as with the arrival of the season Autumn. There is a lot of change happening right now! A good way to stay grounded in times of change and chaos is to keep an altar or a dedicated sacred space in your home. This is a place where you can set your intentions, perform rituals, and charge your decks, crystals, or other sacred items. You can light candles on your altar each day to remind you of the intentions you set for the new moon. Putting your altar in a central location in your home will help you notice and remember your intention as you walk past it each day. Burn Sage for clearing and cleansing. Light candles for dedication and intention setting. Sweetgrass is burned for calling in matriarchy energy and enhancing love, and Palo Santo is burned for healing and purification. Decorate your altar by placing items or pictures on it that are important or meaningful to you! There is no wrong way to set up your altar. Change up your altar often to keep the energy and intention is fresh. 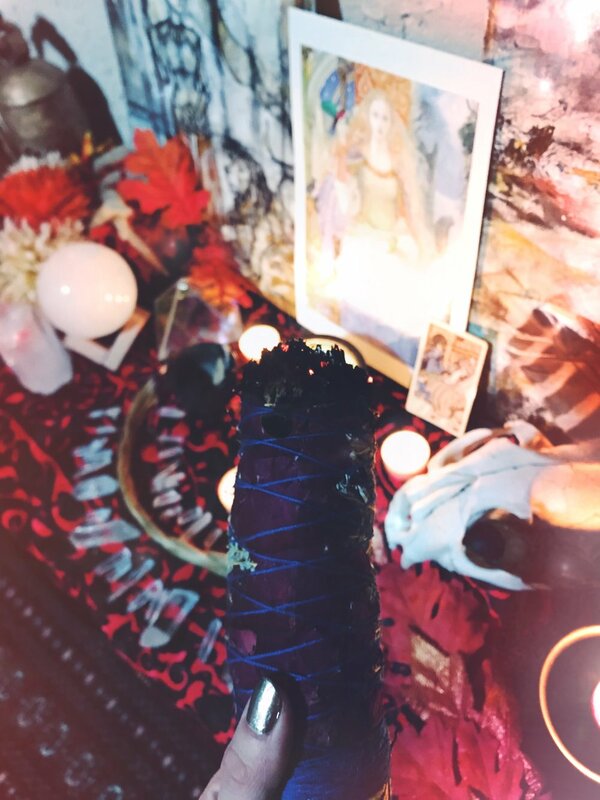 A seasonal altar is a great way to connect with the current sabbats and seasons. 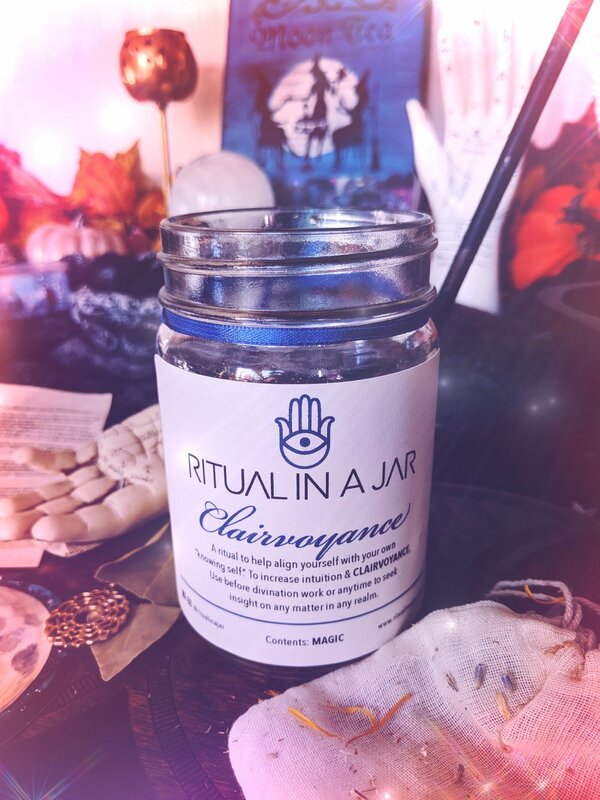 Tonight we also have a magickal ritual to share with you from Ritual in a Jar! They sent us their Clairvoyance Ritual in a Jar just in time for the thinning of the veils. The jar has everything you need to perform the ritual... The candles, oils, sage, and herbs... The aroma when you open the jar is divine. This is a wonderful ritual to awaken your third-eye, connect to your intuition, and perform before any divination practices you do to really enhance them. I was personally over 40 weeks pregnant and my intention for the ritual in the jar was to find out exactly when my baby girl would be born! The ritual comes with a beautiful scroll and gives you step by step instructions to perform the ritual to enhance your intuition. The day I was actually scheduled to be induced and the moon sign Aquarius. October 19th did end up being the day we had our little moon child, and the day started off in Aquarius, but she ended up being a Moon in Pisces like her mama! I loved that the Ritual in a Jar gave me space to clear my head and open my mind since I had been constantly worrying and fretting about going into labor! The ladies of Ritual in a Jar are giving our readers a discount code for any of their jars! Use the code: spiritdelalune for 15% off your order! 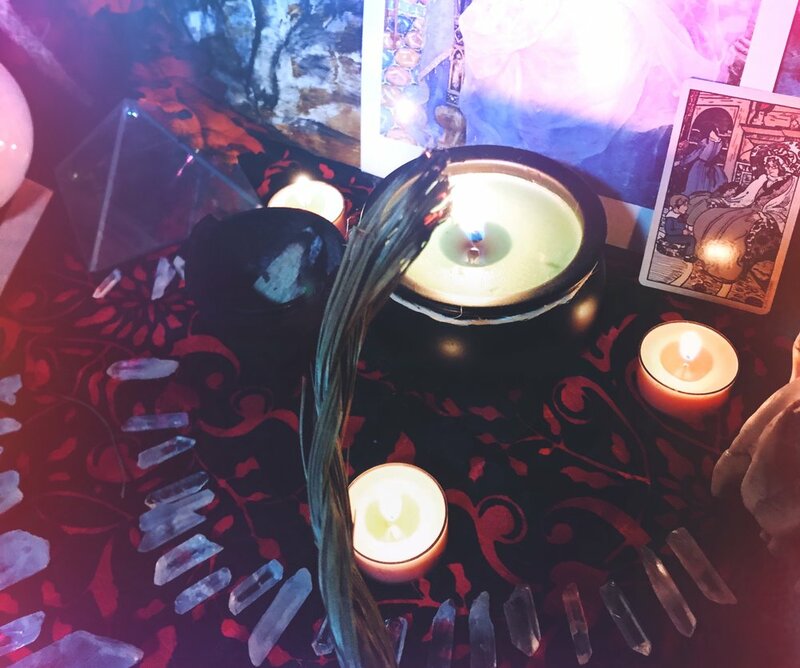 It may be a little too late to try a ritual jar out for this Full Moon, but it’s still a great time to set up your altar and perform a ritual to connect with Spirit. The veil is thinning as we get closer to Samhain, and it’s a great time for connecting with our ancestors and spirits! 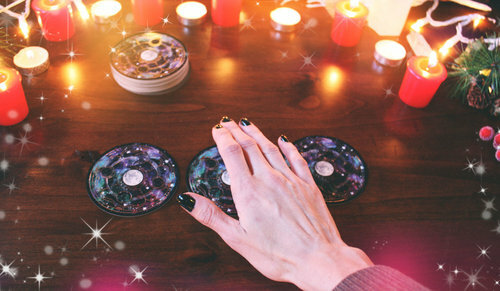 Don’t forget to charge your decks and crystals under the Full Crone Moon! Summer's relentless heat is finally beginning to ease up on us as the winds of Autumn begin teasing us with her cool breeze. We may not use the light of the moon for farming and harvesting to that degree anymore, but the lunar energy can light the way within, helping us discover and cultivate our own desires. The Autumn season tends to pull us towards an attitude of gratitude, but cultivating and living in gratitude on a daily basis has many benefits. Gratitude is both a practice and an attitude. Taking just 5 minutes out of a bad day to focus on gratitude can help shift your mood very quickly... but it also has many long term benefits if done on a consistent basis! Practicing daily gratitude helps create a positive feedback loop in your brain, which then helps create a positive feedback loop to manifest in your outerworld as well. Consistent gratitude helps us algin to our highest potential. It is important to continue your daily gratitude practice. Change can take time, and consistency is needed when it comes to creating new habits and adopting attitudes. So, daily practice is important! Because of that, we felt more than one ritual for this moon wasn't as helpful as focusing on creating a cycle of gratitude. 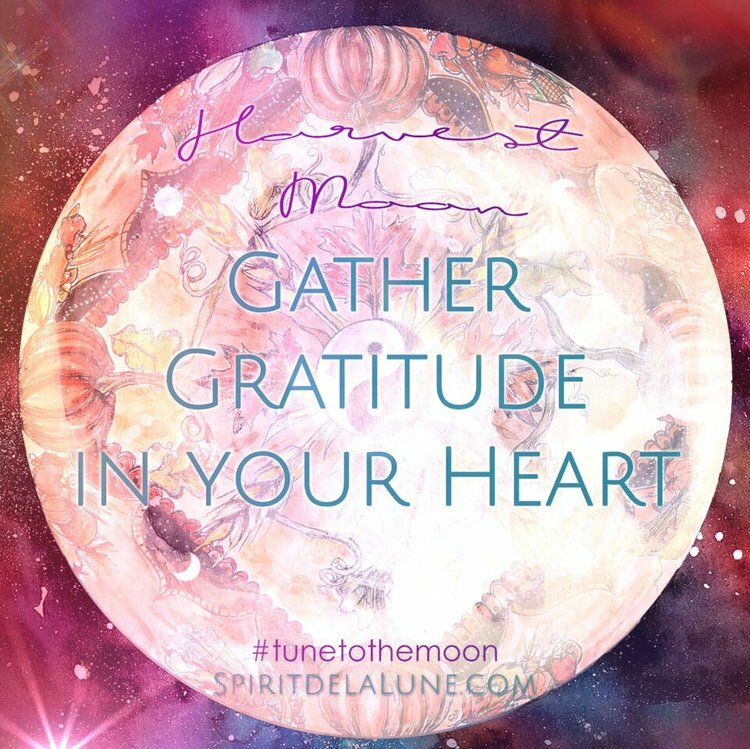 Using the Moon's 4 turnings, we have come up with 4 simple but life-changing daily rituals or practices you can do to cultivate gratitude and step into your most abundant self. Not only does each moon phase hold its own special energy, but Lady Luna is also a helpful reminder for us! The Moon has been used as a calendar for thousands of years thanks to her visible cyclic turnings. The New Moon energy is always a great time to check in with ourselves and our intentions and the act of keeping a journal is an extremely powerful way to give ourselves that mindful moment. It is important that we are aware if we are steering ourselves in the right direction or not. Try dedicating a specific journal just for gratitude. While it is important to vent and process our feelings, a special journal just for gratitude could become one of your best friends. Use the New Moon energy to check in with yourself and your gratitude journal. You could write in your journal during the New Moon/Waning Moon phases as a way to check in with yourself, or you could choose to write in your journal daily, and use the journal to come up with your New Moon intentions. 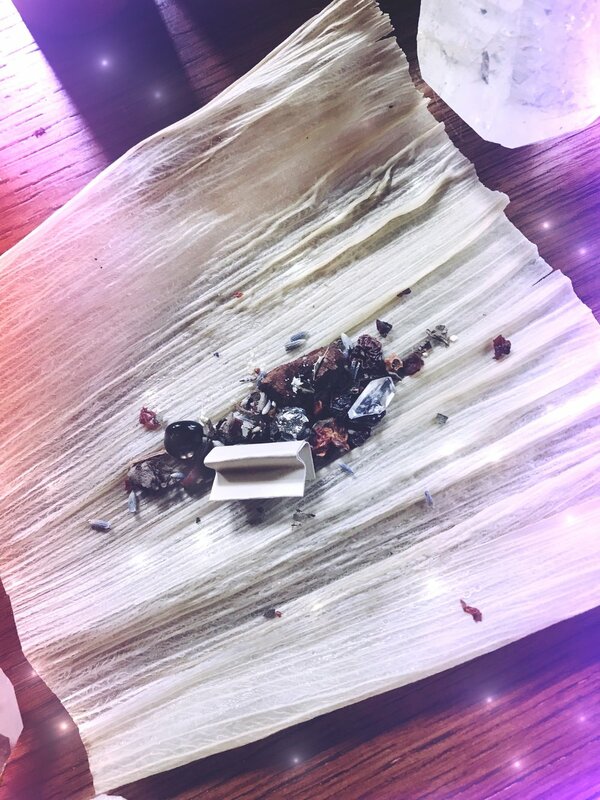 Charge and store your gratitude journal with your crystals or on your altar, or carry it in your purse for when you need a quick mood boost while on the go! Taking just 5 minutes at the beginning of each day to jot down a list of what makes you feel appreciation and gratitude can radically shift your entire day's direction and help you stay clear minded and positive, while also helping you build new positive thought habits on a long term basis. The First Quarter and Waxing Crescent Moon phases hold the energy of the fire realm. Fire is an element that takes both caution and intention when used, making it a powerful element for manifestation and gratitude. Keep a gratitude candle on your daily altar and light the candle with the intention of gratitude and appreciation. Never allow the candle to go unsupervised by keeping it on your main altar and in a place you can watch it often, remembering it's intention and listing something you are grateful for each time you see it. During the First Quarter phases, or whenever you are unable to leave the candle at home lit for long periods, sit and meditate with your candle. Staring at a candle flame is a wonderful "anchor" for meditation use. Meditating on gratitude, while watching the calming flame and listening beautiful music or nature sounds can help put you in the attitude of gratitude leaving you feeling positive and energized for the day. Want to create your own candle? Try out our candle making tutorial for the Honey Moon! A Full Moon Blessing Bowl is a beautiful practice you can cultivate from Full Moon to Full Moon! This is also a wonderful ritual to share with your little ones and family to encourage and nurture gratitude and keep the blessings flowing in your home! You will need to choose a bowl, jar, or basket, to place on your Moon altar (or if you are sharing this with your family, place in a communal area or on your family altar). Label this “Full Moon Blessing Bowl” and feel free to decorate it and make it pretty! Now that you have your bowl or basket, now it is time to put it to use! In this Full Moon container, you will begin to put notes about anything that you are happy for, proud of, excited for, or something that you are grateful for throughout your day. Do this at the end of each night after you moon gaze and journal. You can even put pictures or items that remind you of something special that day. It could be a ticket to a movie or show, or a feather you found on your walk. Anything that moves you. You can do this activity with your family before bedtime too, or have your little ones create a bowl to keep in their bedroom. Soon your bowl will be filled with gratitude’s and blessings! To begin the blessings, place a rose quartz stone as your first item in the basket. This stone will represent the love and heart-opening devotion you have committed to yourself. Hold the stone at heart center and say a prayer about what you wish to cultivate through this practice. Kiss the stone and put it in your bowl. Now go charge it under the moonlight! Do this practice from Full Moon to Full Moon. Each Full Moon place the bowl under the moonlight. You can even transfer your blessings from the last moon cycle into another jar or box. You can go through this box once a year, or once a season, and it will literally feel like a treasure chest! At the end of the year or season, you can burn the notes in your cauldron and the other items you can donate or leave as offerings to the land. This releases the blessings back out into the universe and thus the cycle continues. As mentioned previously, gratitude creates a positive feedback loop in our brains, and then eventually manifests in our physical lives as well. One way to continue this effect in your own life is by spreading it to others. Gratitude naturally makes us less self-centered. Love is the core emotion behind gratitude, and when you spend a lot of time practicing the attitude of gratitude, you will naturally want to spread it to others. Become someone's reason to feel grateful! The Last Quarter Moon and Waning Crescent phases are a good time to check in with others and see how we can best support those in our tribe. The Earth element can be felt during this time, and it's important to remember that we are always planting seeds. Random acts of kindness or small acts of love will not only improve someone else's life, they will help you stay mindful and grateful. It's surprising what a simple "thank you" to someone can do! There is a lot of truth in the quote "A person who feels appreciated will always do more than expected." We aren't saying to be grateful for selfish reasons, but that the attitude of gratitude is contagious. When people feel appreciated, they show up more. In fact that's how a lot of things tend to work. The more you appreciate something, the more it begins to show up in your physical world. This is the beginning of the positive loop that gratitude can create in your life! What are some of your favorite gratitude rituals and practices? Have you noticed any of the benefits? Don't forget to charge your decks and crystals under this Full Moon, and begin creating your blessing bowl! Sign up with your email address to receive news and updates about the deck! Creating A Corn Dolly for Lammas Under This Powerful Eclipse! This Full Moon has had a lot of buzz around it for a while now... And we can all certainly feel why. Things have been emotional and intense for a lot of us! There is a major rebirth under way on many levels. Full Moon Eclipses, also known as Lunar Eclipses, usually mean that a BIG revelation is on it's way. Eclipses mean shock, big news, and secrets coming to light. Expect the dissolving of any illusions and a new chapter to begin. This lunar eclipse is the longest eclipse of the 21st century. The eclipse is expected to last almost 4 hours- 2-3 hours longer than a typical eclipse! A total lunar eclipse happens when the Earth comes between the Moon and the Sun, blocking the Sun's light from the Moon's surface causing it to turn a deep blood red. The sun represents our ego and all we can see easily about ourselves... while the Moon represents our hidden subconscious, or our "shadow" selves. An eclipse causes us to shed our egos. We are vulnerable, as our true nature can no longer be hidden. Our masks must come down, and we are forced to face our deepest selves. Look for the lessons that are meant to be learned at this time. Be aware of your reactions and reflect instead! Don't forget to back up your computers and hard-drives, because Mercury is going retrograde today! In our New Moon Energy Report we had mentioned these intense waters and how to best handle them. For the Full Moon cycle, we pulled the Envision card. "With so many planets retrograde right now, surrender and allow yourself to slow down and reflect. There may not be much that you can physically do at this time, but you can spend a lot of time visualizing how you want the outcome to be. Focus your emotions and visualize the end results if you begin to feel frustrated or doubtful at your progress." Tonight we are tapping into that visualization energy for tonight's Full Moon Ritual. The Corn Moon is the first Full Moon of the harvest season. We have had a few people ask why we are celebrating the Corn Moon in July this year... so before we begin our ritual, we wanted to explain what's up! Some of the Full Moon's seem a little "early" because Spirit de la Lune follows the traditional Lunar calendar, instead of the Gregorian calendar. Remember when we had 2 Full moon's in January, and 2 Full Moon's in March? That meant there was no Full Moon for February. This makes the names of the Full Moon's feel early to those who follow only the Gregorian12 month calendar. Spirit de la Lune honors the 13 Full Moons of the year. 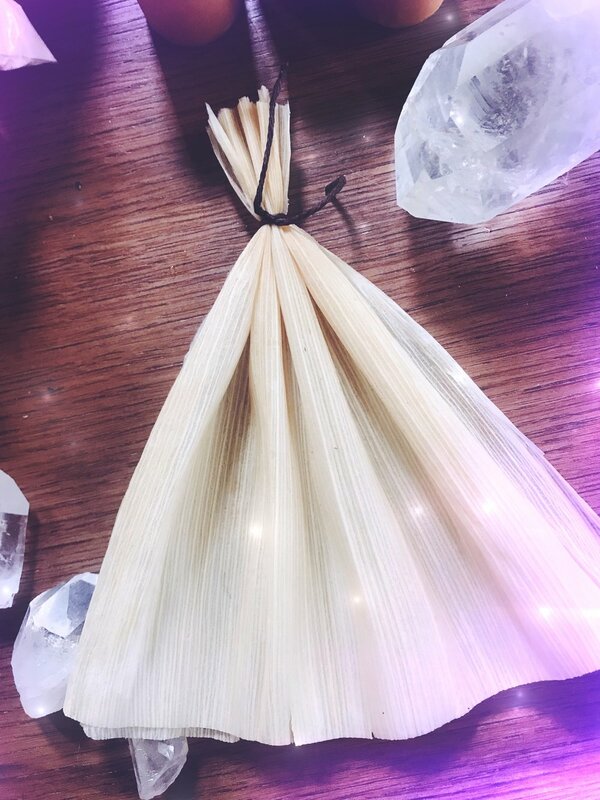 Using this intense Lunar Eclipse, and the energy from the Envision card from our New Moon Reading, we thought a Corn Dolly would make the perfect ritual for the Corn Moon! Lammas, or Lughnasadh is the Pagan sabbat that marks the beginning of the harvest festival on August 1st. Corn Dolls have long been used as altar pieces for Lammas since ancient times. They are a recognized figure from many cultures! Our Corn Doll Tutorial have a special extra step that we added in just for this ritual! Corn Doll are traditional pagan magickal charms/figures thought to protect the home or personal wellness of the maker and their household. We are putting a special twist in our dolls by adding some herbs, intentions and crystals into the heart of the doll. Paper with intention or goal written out in present tense. I found my corn husks at the grocery store. They are typically used to make tamales, so you'll have extra husks to try out a new recipe. Or you can get some corn on the cob for your Lammas dinner and use the left over husks from that! 1. Soak your corn husks in water for about 30-40 minutes until they are malleable. Strain and allow the husks to dry out just a bit. You'll want to work with the husks while they are still pretty wet or they will begin to crack. 2.Take one husk and cut it so that you have a rectangle/square of about 5-6 inches. 3. Add your herbs, crystals and intentions to the middle of this square. You can use two husks here for extra support if you need to. 4. Roll up the husk tightly. 5. Secure the ends with a string on each end. This is the "heart" and arms of our dolly! 8. Part the husks again, and slide the arms up between them, as close to the head as possible. Tie off again with a strong knot, creating the waist. Your herb and crystal bundle should be right in the heart of your doll. 9. Trim the arms to the length you want them and cut any loose ties. You could be done with your Corn Dolly at this point, but there should be sone left over husks for additional decoration if you want. 10. Cut and fold the last corn husk over the dolls shoulders and an additional layer of skirting and secure the waist with a knot creating a shawl and a fuller skirt. Trim the skirt in the way you want it and you are done! You now have a traditional pagan Corn Dolly in time for your Lammas altar that was created under a very powerful Eclipse and infused with your intention. Leave your doll out under the Full Moon and let it charge with the Lunar Eclipse and Corn Moon energy. Don't forget to thank your doll each time you see it! We would love to see any pictures of your corn dolls if you choose to make one! Please tag us on instagram #spiritdelalune so we can see your doll and feature it on our feed! We are also hosting a giveaway this month! We are currently in the process of planning and designing our 2019 planner... and we need your help! We would love your input for the new planners and have created an easy way for you to help us out AND enter to win our giveaway! Let's Align with Our Bliss! In order to truly follow our bliss, we must align to our centers once again. Our energy centers, or Chakras, run along our spine and are located along the center of our body. When we align back to our center we can truly connect to our purpose, find clarity, and our bliss will be easy to follow! So let's do a simple Chakra alignment meditation under the Full Blessing Moon! Gather 7-8 stones, one for each Chakra, your Blessing Moon card from the deck, and a glass jar of spring water. That's it! The stones shown here from bottom to top: Red Jasper, Carnelian, Citrine, Green Jade, Turquoise, Blue Apatite, Amethyst, and Clear Quartz. Find a quiet place where you will not be disturbed (under the moonlight is best! ), and create a space to lay down or sit comfortable. Take your stones and if you are laying down place them along the center of your body: your red stone by your pubic bone or groin area; orange stone about 2 inches below your belly button; your yellow stone on your belly button; the green (or pink) stone resting on your heart; the blue stone on your throat; the purple stone between your eyes (your third-eye); clear stone at the top of your forehead, or on the ground next to the top of your head. If you decide to sit down surround yourself with your stones in the same order, or hold them within your palms. And now relax and enjoy the energy of the Full Moon and your crystals. Notice the energy of each stone interacting with your energy... notice any emotions or thoughts that surface and allow them to rise. Are there any messages coming through? 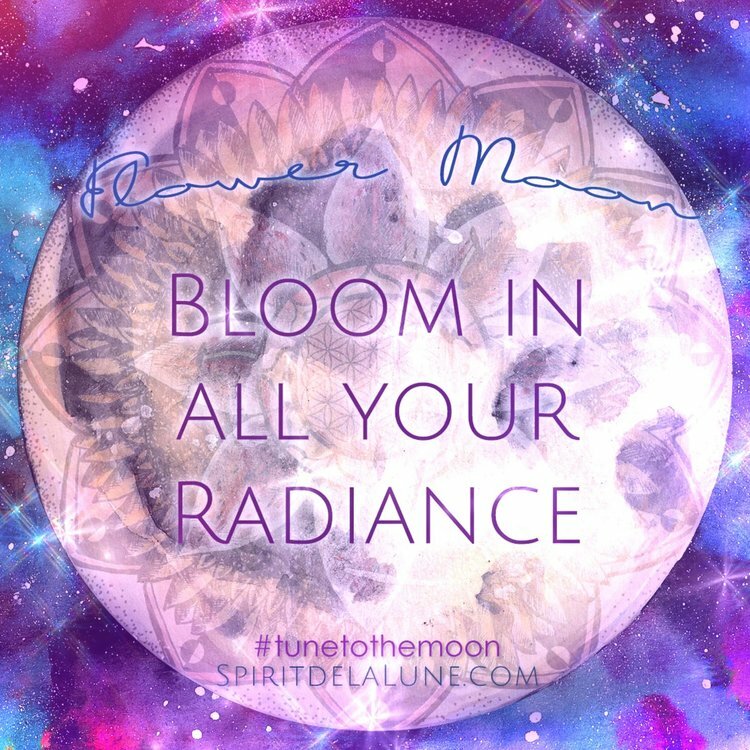 Visualize the beautiful Full Moon ray's coming down through your Crown chakra and move down through your Root chakra... cleansing and recharging each of your energy centers. Stay in this beautiful meditation until you feel revitalized and realigned with your mind, body, and spirit. Feel free to journal about your experience afterward. With the same stones you used during your meditation, now it is time to make Chakra Blessing Moon Water! Depending on the the type of crystals you use, you can either place the crystals in the glass jar with spring water or surround the jar with the stones. Always research which stones are safe to use in water prior to use... or when in doubt, leave it out! Place the Blessing Moon card underneath the jar and let your Chakra water charge under the Full Blessing Moon in Capricorn! Let is charge all night under the moonlight! You can make a big pitcher or small bottle, whatever you prefer! In the morning bring your water inside and take the gemstones out. Feel free to drink the whole glass to really help integrate the alignment, or make smaller bottles of this water, or even just water your plants with it. I would at least drink a couple of sips to get the benefits for your chakras! We hope this simple realignment ritual recharges you and brings you back to center. Feel free to do this whenever you need a pick-me-up.